Pivoting Glass Table Desk Clock with Gold Brass Columns Mounted Cherry Wood Base with Gold Engraving Plate. This four metal gold and silver column desk clock features a clock suspended in glass displayed within four glossy gold and silver finished columns. Elegant Roman numerals and deluxe quartz movement complete its display. ♥ FREE Engraving 1-5 lines on custom gold engraving plate with black text. Personalized Wedding Gift, Anniversary, Service Award, Retirement Employee Recognition Gift. This elegant desk clock features a brass top and bottom panel with glossy wood cherry display and suspended Da Vinci gear clock. Elegant Roman numerals and deluxe quartz movement complete its display. Corporate award clock, employee recognition clocks and appreciation clock award at cheap prices. Our Corporate award clock, employee recognition clocks and appreciation clocklion awards trophy awards and appreciation gifts truly encourages you to recognize the excellence and achievements in a unique way. We sell custom award clocks, custom award clock, gold clock, personalized clocks, achievement clocks, clock ribbons award, appreciation marble, trophies, corporate trophy marble and service awards. A beautiful decoration for office or home and makes a unique executive, employee retirement, graduation gift, recognition service award, etc.. Every personalized award desk clock product we manufacture and sell are filled with distinction and imagination. 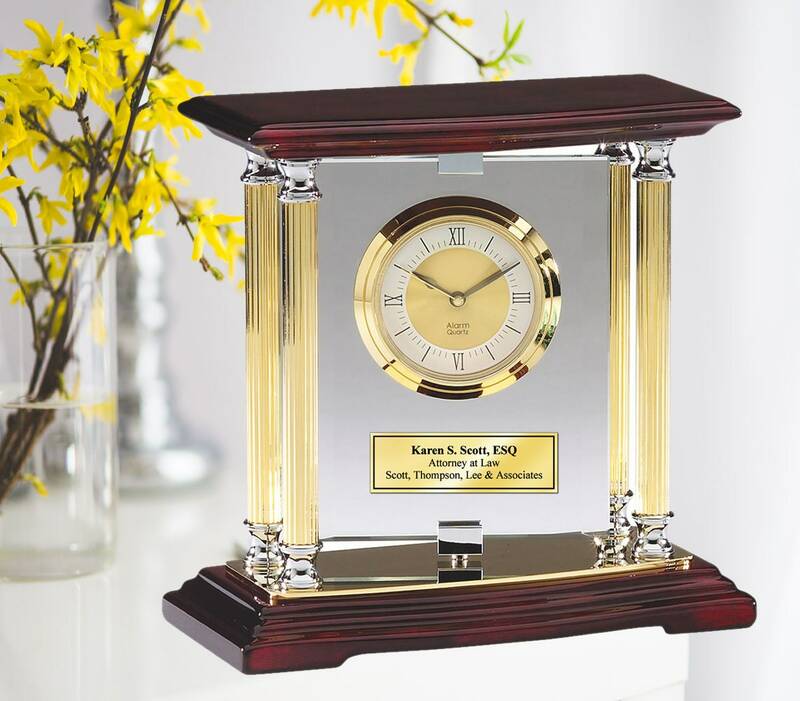 Employee Recognition Executive Clock Award with Gold Engraving Plate. Online promotional products and gift clocks.